UPKUtils is a set of utilities for analyzing and patching uncompressed UPK files. Also includes PatcherGUI - a tool to install and maintain modifications for XCOM:EU and EW. added infinite loop detection to PatchUPK. 03/27/15 - v.7.1: PatchUPK updated to v.7.1: fixed bug with parsing the last line of the modfile. 09/13/14 - v.5.2.4: PatchUPK updated to v.5.5. 09/09/14 - v.5.2.3: PatchUPK updated to v.5.4 (see PatchUPK_Readme.txt). 09/06/14 - v.5.2.2: PatchUPK updated to v.5.3 (see PatchUPK_Readme.txt). 09/05/14 - v.5.2.1: PatchUPK updated to v.5.2 (see PatchUPK_Readme.txt). 09/02/14 - v.5.2: Disable phoning home option added. 08/31/14 - v.5.1: Cosmetic interface changes: help, status bar, separate log window. An ability to disable specific package hash check added. 08/30/14 - v.5.0: PatchUPK updated to v.5.0 (see PatchUPK_Readme.txt). XSHAPE button (and program) removed. An option to remove hash checks added (see PatcherGUIReadme.txt). An option to enable direct ini editing added (see PatcherGUIReadme.txt). 04/24/14 - v.4.0: PatchUPK updated to v.4.0 (see PatchUPK_Readme.txt). 04/08/14 - v.3.2: PatchUPK updated to v.3.2 (see PatchUPK_Readme.txt). Added text fields and buttons tool-tips on mouse-over. Added XSHAPE button to recalculate hashes for XCOM:EU. 04/01/14 - v.3.1: PatchUPK updated to v.3.1 (see PatchUPK_Readme.txt). Renamed "Install" button to "Apply" button. Added new log feature (see description below). 12/21/13 - v.1.3: changed EXPAND_FUNCTION size check so it won't generate error when new size is equal to old size. Note that since v.7.3 all the programs are UAC aware. This might fix the issue with executables not running properly for some users. Also note that in case of any modding related problems it is strongly recommended to move Steam (or just XCOM) out of the Program Files folder tree (see Moving a Steam Installation and Games guide). Attention! If you're updating from v.6.1 (and earlier versions) to v.7.1+, please, read the following text carefully! The major change of v.7.0 is that it uses different lzo decompress program for the sake of cross-platform compatibility. So if you're updating from any of the previous versions by copying new files over the existing ones you need to either delete PatcherGUI.cfg file (it is located under main PatcherGUI folder) or use "Advanced -> Settings" menu option to manually change decompress.exe file path to DecompressLZO.exe file path. Do not forget to check your game folder setting, as removing PatcherGUI.cfg file will reset it to default! I also recommend to manually clean up your backups folder (PatcherGUI\Backup), as new backup algorithm uses different sub-folders for different install paths. If you're experiencing any kind of problems with v.7.0, please, revert to an older version (still available on the downloads page) and report the problem here (use Discussion tab above). Remember: in case of any serious problems the best course of action is to revert your game to vanilla using Steam cache verification option and then to install a fresh copy of PatcherGUI. 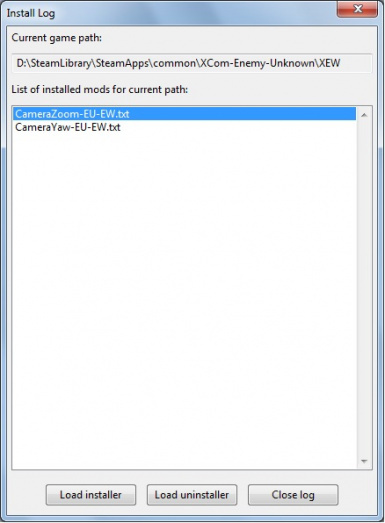 Note that if you just need to install a mod which has UPKUtils as requirement, you have to download PatcherGUI only. It already includes main upk tools and does not require separate UPKUtils download. Note for Long War users: since LW already has phoning home disabled (and all the other necessary things done), all you need to do to install a mod for LW with PatcherGUI is to choose the right game folder (XEW) and open and apply the mod file. Note for Linux and Mac users: both PatcherGUI and UPKUtils are cross-platform, but you need to build them yourself (see github links below). UPKUtils is a set of utilities for analyzing and patching uncompressed UPK files. Since v.7.0 the set includes HexToPseudoCode tool - hex code decompiler, which produces ready-to-modify PatchUPK/PatcherGUI scripts. 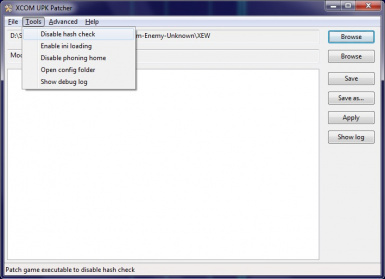 PatcherGUI is a tool to install and maintain modifications for XCOM:EU and EW. 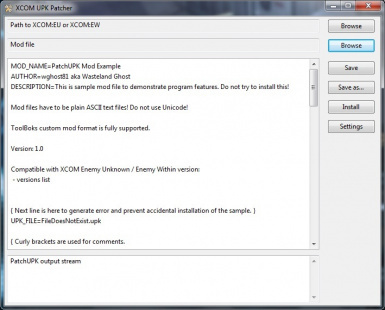 It already includes all of the upk tools necessary to install XCOM mods, so there's no need to download the whole UPKUtils package if you don't plan to create your own modifications. - disable phoning home (automatic ini re-downloading and re-writing). To read PatcherGUI readme click "README" link above. To read change log click "CHANGES" link.